The iconic Dansko Professional clog may not be the most stylish women's footwear, yet millions of women switched from the fancy designer shoes to wear these clogs. The comfort and support is obvious from the first time you slip them on. 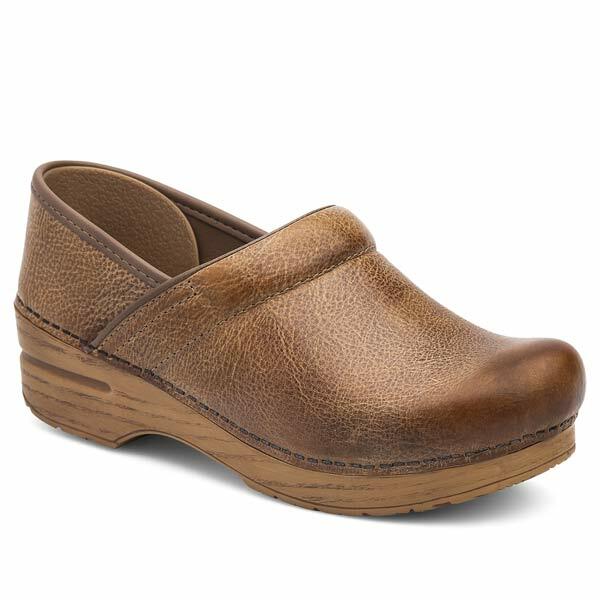 These Dansko clogs a perfect for work or activities that require lot of walking and standing. Go ahead and join the club of women that put foot health first, and you will never look back. The Honey Distressed leather compliments the natural color sole of these Dansko Professional clogs. Dansko Professional Clog Collection carry the seal of Acceptance from the American Podiatric Medical Association. Ladies EU 35-43 (US 5-13). If you are a half size, you may be more comfortable sizing up. For example, if you are a US 7.5, you may be more comfortable in a EU size 38.